Catholics were recorded in Harrisonville as early as 1847. Harrisonville acquired the status of a mission church in 1884. From 1884 – 1910, Mass was said once a month in the home of John McGuire by the priest who was visiting Pleasant Hill. Originally Pleasant Hill was a Mass station on the circuit of traveling missionaries. For years Harrisonville was a mission of Pleasant Hill. As the Catholic population in Harrisonville outgrew the Pleasant Hill Catholic population, St. Bridget became our Mission Parish, even though it was the oldest Catholic Community. Also, St. Sabina was originally a mission of Lourdes in Harrisonville. Both Lourdes and St. Sabina were founded by the same priest, Fr. Thomas J. Crowell. In the fall of 1939, a Civilian Conservation Corps established a camp southwest of Harrisonville. There were a number of Catholics in the camp and beginning in June of 1940 Sunday Mass was held there for them and other local Catholics. This was continued until June, 1941, when Sunday Mass was continued in the parlor in the Hotel Harrisonville until October of that year. Several weeks prior to October, 1941 the large brick residence at 608 West Wall (which still exists today) was purchased from the Estate of Mrs. Manwell Williams. The residence was converted into a chapel, and it also became the home of its pastor, Fr. Crowell. 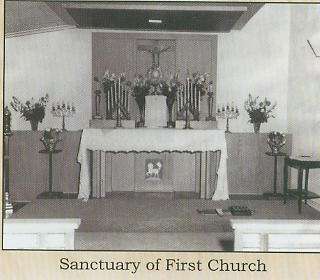 The parish was officially named on February 12, 1941. The parish consisted of twelve families. In l945, a church was built east of the rectory. It was dedicated by Bishop Edwin O’Hara on January 11, l946, and could seat 120. A parish hall was added to the rear of the church in 1952. With the continued growth of the parish, the hall was remodeled and used for additional seating, bringing the seating capacity to 180. In December 1970, plans began to construct a new church on the property of Highway 7/Mechanic St. This property was donated by Bartles and Teresa Henderson. Construction began on December 5, 1972 and the church was dedicated by Bishop Charles Helmsing on August 5, 1973. The church cost $182,000 and the seating capacity was 350. The effects of population increase compelled Fr. Don Cleary and the parish to build an addition onto the church which was completed in 1989 for $233,000. Fr. Bradley Offutt, (now Msgr. Offutt) took on the project of building our third/current church after many years of people standing during Sunday Mass, sometimes to the front doors of the church! Even though St. Bridget Parish had their own church and pastor by 1999, our attendance did not change, remaining overcrowded every weekend. The new church building project began in 2000 and was dedicated by Bishop Raymond Boland in August 2004 with a seating capacity of 647. The building project cost $2,535,085 which included moving the SOR building and the church furnishings.